It's time for all things Easter this month, and Taste Creations is no exception. This month we are serving you all kinds of homemade candy treats to make for the holiday. 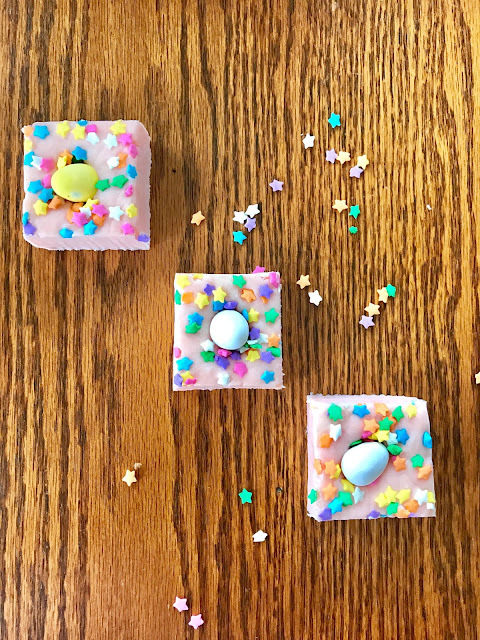 When I was doing my research for what I wanted to make, I ran across this Unicorn Fudge by Sprinkles for Breakfast (isn't that a darling name?) and inspiration struck. The fudge recipe is so adaptable to the holidays, you will be seeing me make it for all kinds of things. Why homemade treats? One of the main reasons, for me, to make my own treats is simply to control the ingredients that go into the food. If I can limit the amount of bad stuff that goes into a food that is already not the best healthy choice, then when the treat is used as a treat, it isn't horrible. How is that for logic! 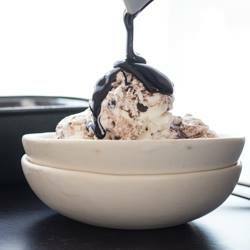 You will love how easy this recipe is. I am totally enamored by how easy it is and how good it tastes. Prepare an 8 by 8 inch square pan with parchment paper or nonstick foil. Melt the white chocolate disks in the microwave following the directions on the package for melting. Add the drop of food coloring and mix until incorporated fully. Add melted butter and condensed milk and stir. Watch the magic happen! The fudge will come together and make candy! Pour into the prepared pan and smooth with a knife or roller. Sprinkle on sprinkles and press into the fudge. Refrigerate until hardened, then cut into squares with a knife. Store covered up to a week in the refrigerator. 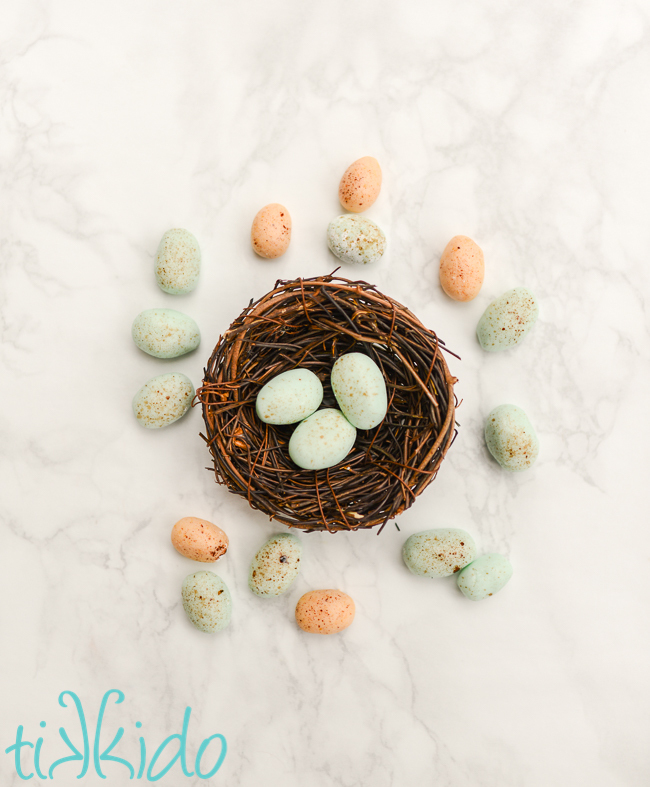 Your Easter celebrations will be wonderful with these adorable and yummy treats! If you are a food blogger and would like to join our monthly Taste Creations event, email me at terri@terristeffes.com and request to join! Oh , YUM! This recipe looks so easy, and the finished product is SO CUTE! I can't wait to see what other adaptations you make. Thank you Nikki! I can't wait to try your buttercream mints! Oh my gosh! This just looked so sweet, I had to check out the recipe. I love this for Easter because it is so festive, but also the perfect finger food size for entertaining. I actually think you could wrap this up and put it into an Easter basket! I will definitely try! Aw! Thank you so much for visiting. You made my day! Thank you for visiting, Michelle! 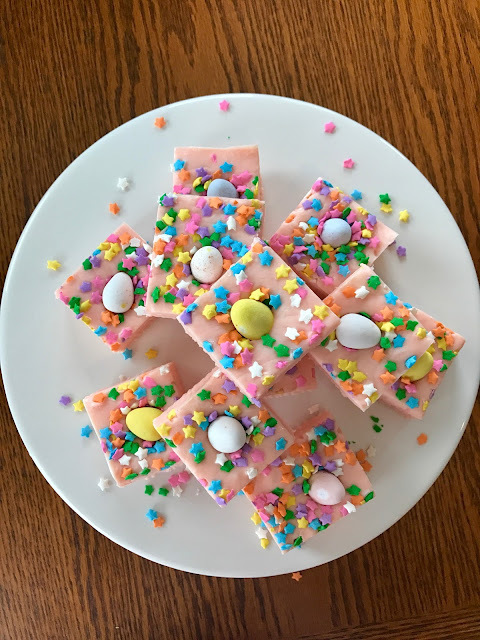 Pink fudge is perfect for Easter and this looks extra delicious! This looks adorable. I cant wait to try it. I need to remember this for next year. I usually have to do some easy treats for TV segments and I don't have a recipe like this. Following on P too. This is adorable and look so easy! I'm totally going to try this. My family is crazy for fudge. I have never made fudge, but this looks so good...and so festive! :) Off to pin it! These treats are adorable, Terri! One look at them make me smile. They are so colorful and happy! What a cute idea...this is so bright and fun! Oh this looks delicious! I am so passing this to a friend who was looking for Easter treats! Oh these look seriously so delicious!! This look like a great way to finish our Easter lunch. I love the bright colors of the candies this time of the year. It's too pretty to eat! This is so fun! I bet it tastes delicious too! My kids would love it. Fun and looks super yummy! This looks as cute as it looks delicious! 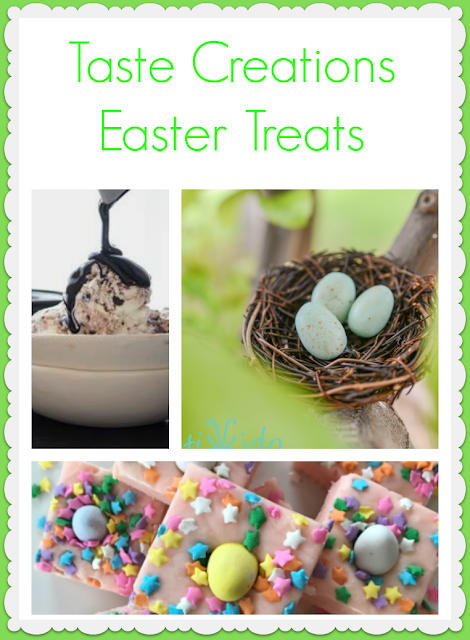 What a great addition a plate of easter bunny would be to the dessert table. Need to try making this!!! This fudge looks so tasty and so fun. Since I don't celebrate Easter, I really love how I could still make this for a spring or unicorn celebration. This looks yummy! I bet my family would love this special Easter treat. I saved this post because YUM. I have a thing for fudge and all the colors are so pretty! That is such a beautiful fudge! I dont really like chocolate that much though lol, I bet cookies that looked like that would be yummy too. Oh yum! Making this for Easter!! I love fudge and yours looks amazing Terri, can't wait to try it! Looks really good! Very similiar to a fudge I made in February for Valentine's day. Mine was pinker though. This fudge not only looks cute, but it looks delicious! I adore making fudge for the holidays, but I've never tried this spring version before. Definitely making it, so thank you for the inspiration! Wow that looks absolutely yummy and delicious. This is really perfect for Easterand I'm sure the kids will love these. Thanks for the recipe! What a fun dessert for Easter. Oh this is so cute and looks yummy!